Okay, my obsession with chocolate and peanut is no secret around here. But two posts in a row? Yah, that’s kind of obnoxious, even for me. See, I liked the flavor of those cut out cookies enough that I was sort of jealous of the cut-out cookie eaters in my life. They liked the flavor and the texture – that flat, crisp-edged cut-out cookie texture. You know. That one I don’t like much. And, while those particular cut outs are neither as flat nor as crispy as some, they were, well, still cut-out cookies. But, we know how I roll, right? I am forever adaptable. All it takes to morph a cut-out cookie into a drop cookie is a bit less of the dry stuff, and a bit less of the sweet stuff. Oh yah. Now, these. These make me happy. In a large bowl, beat the coconut oil until creamy. Cream in the sugar. Add the flax egg and beat until light and fluffy. Add the rest of the ingredients (except peanuts) and beat until a smooth dough forms. Stir in the peanuts. Drop by spoonfuls onto parchment-lined baking sheets. With a fork dipped in water, make criss-cross marks on the top of each cookie, gently flattening them. For more slightly indulgent recipes, visit Slightly Indulgent Tuesdays. 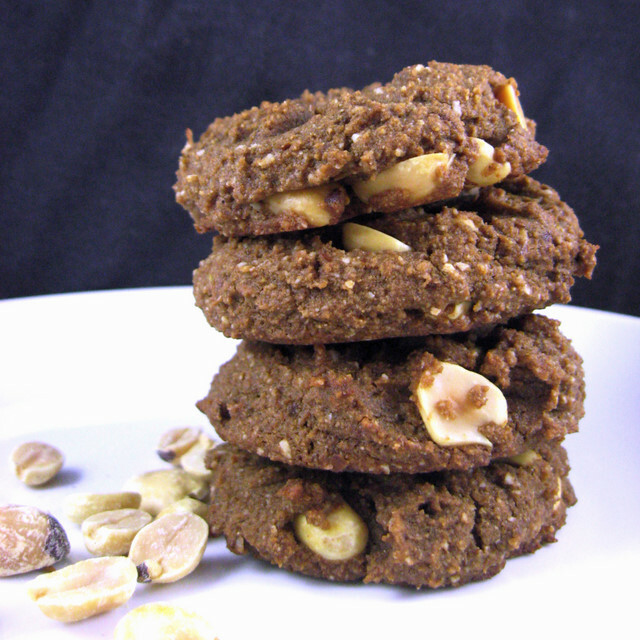 This entry was posted in chocolate, coconut, flax seed, grain-free, nightshade-free, nuts, vegan and tagged chocolate, cookie, gluten-free, grain-free, nightshade-free, peanut, recipe, vegan. Bookmark the permalink. Thank you! That makes me feel so good to know that I’m encouraging you to experiment. Really – it’s all so much fun when you give your self permission to fail. And really, you’ll fail less than you might think. One tip – if you’re not sure you have the right amount of dry ingredients, it’s best to bake a single batch (or heck a single cookie) first. Then you can adjust ratios if you find that your cookies do the melt into a puddle thing. I’m definitely not one to criticize. I’ve got three peanut butter chocolate cookie recipes on my blog, and two more that I haven’t dared to post yet. These look fabulous Deanna! Love the flour usage too. Thanks Alisa. It is a very common (yet wonderful) combo of flavors, is it not? Thanks Amber. You know, I actually like the rolling and cutting out part of cut-outs – just not the eating part. I’m weird. I know. I’ve been waiting to make these for my family, but I can’t find peanut flour in the stores and after seeing it online I’m not sure it’s worth the price, and the shipping. Is there a substitue I can use instead of the peanut flour? Thank you!